Each bottle contains 120 metered doses of Olopatadine Hydrochloride INN. Each actuation delivers Olopatadine Hydrochloride INN 665 mcg. (Equivalent to 600 mcg of Olopatadine). Olopatadine, an antihistamine, works by blocking the action of histamine in the body, which reduces allergy symptoms. Olopatadine Hydrochloride treats sneezing, itching, runny nose, and other nasal symptoms of allergies. Lopadine Nasal Spray contains 0.6% w/v Olopatadine (base) in a nonsterile aqueous solution with pH of approximately 3.7. After initial priming (5 sprays), each metered spray from the nasal applicator delivers 100 microliters of the aqueous solution containing 665 mcg of olopatadine Hydrochloride, which is equivalent to 600 mcg of Olopatadine (base). Lopadine Nasal Spray also contains benzalkonium chloride (0.01%), dibasic sodium phosphate, edetate disodium, sodium chloride, hydrochloric acid and/or sodium hydroxide (to adjust pH), and purified water. 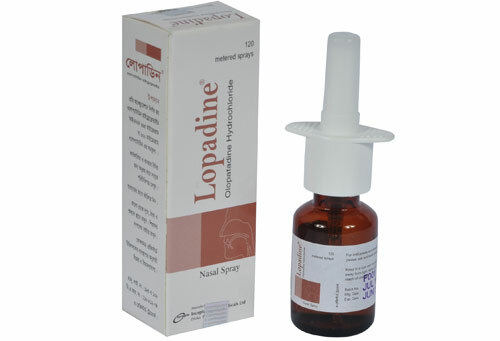 Lopadine Nasal Spray is an H1 receptor antagonist indicated for the relief of the symptoms of seasonal allergic rhinitis in adults and children 6 years of age and older. Administer Lopadine Nasal Spray by the intranasal route only. Adults and Adolescents 12 years of age and older: Two sprays per nostril twice daily. Children 6 to 11 years of age: One spray per nostril twice daily. Priming: Before initial use, prime Lopadine Nasal Spray by releasing 5 sprays or until a fine mist appears. When Lopadine Nasal Spray has not been used for more than 7 days, re-prime by releasing 2 sprays. Avoid spraying Lopadine Nasal Spray into the eyes. Patients should be informed to avoid spraying Lopadine Nasal Spray in their eyes. Pregnancy Category C; No adequate and well-controlled studies in pregnant women have been conducted. Lopadine Nasal Spray should be used in pregnant women only if the potential benefit to the mother justifies the potential risk to the embryo or fetus. It is not known whether topical nasal administration could result in sufficient systemic absorption to produce detectable quantities in human breast milk. Lopadine Nasal Spray should be used by nursing mothers only if the potential benefit to the patient outweighs the potential risks to the infant.